April 26 2010 Reply By Kevin Trenberth | Climate Science: Roger Pielke Sr. I do not understand the figures Roy has presented. I am attaching the official CERES figure from the “The State of the climate in 2008” published in BAMS and I have added in pink a characterization of the departures from normal which are rather different than those Roy presents. There are different versions of CERES and we also have a more up to date figure that includes an extra year, but it is not my figure and I can not pass it on: it does not change much though. The biggest changes in OLR are associated with high cold clouds from convection, but such clouds are also very reflective and so the net radiation often changes very little. So one should pay most attention to the net as the large short-term perturbations, such as from the Madden Julian Oscillation or El Nino, have large canceling components in the short and long-wave. 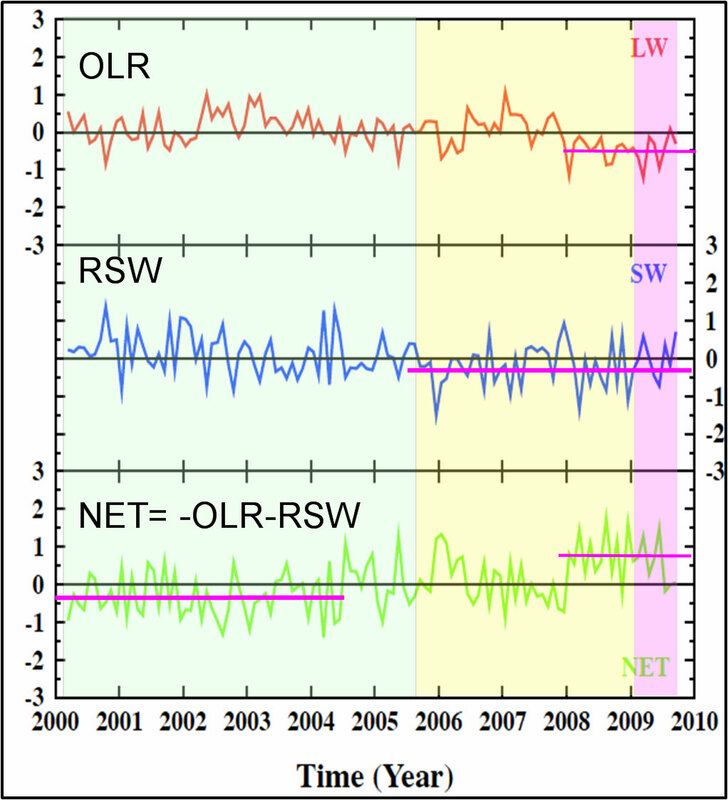 It is noteworthy that the RSW in the figure is lower after 2005 when the data were preliminary (but these have now been confirmed) and some difficulties arose from changes in the Japanese geostationary satellite. But the biggest change seems to me to be in 2008 through 2009 in OLR. Roy suggests that these are related to temperatures, but the second plot shows the annual mean surface temperatures for 2008. 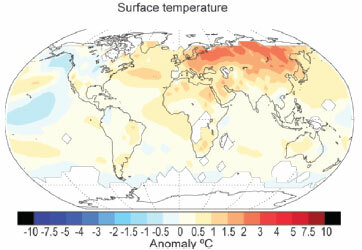 Although January temperatures were very low, the year as whole was not and it is not an explanation. Once the data are released by CERES, it will be interesting to plot the patterns of OLR anomaly. We have tried that using the uncalibrated products available from the Climate Prediction Center but they are not good enough. Similarly, cloud anomalies are not revealing, as can be seen from the figures in “The State of the climate in 2008” published as a supplement to BAMS: see Figures 2.19 and 2.20. It would not surprise me if indeed part of the explanation for the missing energy is because of the CERES data, which are still undergoing processing before being released for the period after November 2005. However, the fact that the data are not available for full diagnostic studies highlights the needs for more priority to be given to all of these observations, which was a central point of our Science article.